I have often heard the phrase, “Follow your heart.” However, that phrase is not scriptural. Occasionally, I will switch versions of the bible, just for something different. I often find a familiar scripture worded a bit differently, and so it stands out to me. This happened recently when I was reading Proverbs 23:19. 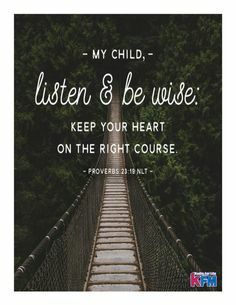 “Listen, my son, and be wise. Lead your heart in the way.” (NLV) Notice that it says for you to lead your heart in the way, not “let your heart lead you.” I have heard many stories where someone is committing adultery. One excuse they use is that they let their heart lead them because it felt good and right. Had they led their heart, they may never have gone down that destructive path. The same could be said for many who have gotten caught up in sin. They followed their heart – their deceitful and desperately wicked heart, and now they are reaping the consequences of it. They leave a trail of bitter tears, broken families, damaged relationships, and shattered lives. Often times, following their heart will lead to addictions, which cause them to lose their jobs, leaving them penniless and bankrupt. Jeremiah 17:9 tells us our heart is deceitful above all else, and desperately wicked. This is all the more reason for us to be diligent in leading our heart. The account of when Peter denied the Lord three times in Matthew 26 has always fascinated me. This man was in the inner circle with Jesus, yet when the heat comes on, he denies Him, not once, but three times. I find it interesting to notice the sequence of events. In verse 58, we find that Peter is walking in the direction of Jesus, but he does so at a distance. He has gone from being up close, in that inner circle, to following at a distance. This reminds me of Psalm 1:1 when it speaks of how the godly will not walk in the counsel of the ungodly. In following at a distance, I would imagine there were times when Peter stopped, and stood still, thinking, “I’m getting too close. I need to stop for a bit so they don’t see me.” This could be likened to standing in the path of sinners, from Psalm 1. Next, we find in verse 69 that Peter is sitting outside in the courtyard. He has now made himself comfortable. This is similar to sitting in the seat of the scornful, from Psalm 1. He just keeps getting deeper and deeper in his distance from the Lord. In that distance place, the disastrous result is that he denies the Lord three times. In verse 70, he simply denies him. His heart turns just a bit harder. In verse 72, he steps it up a bit by denying Jesus with an oath. His heart gets even harder. In verse 74, he not only denies Jesus, but he curses and swears. This is how the deceitfulness of sin can snare us. First, we have just a bit of distance from the Lord. Perhaps we skip a few days of reading the bible and praying. Next, we think we are doing fine, so we skip a few more days of devotions, and even skip attending church. We don’t notice our heart’s coolness to the things of God. Before we know it, we begin to deny the Lord in our thoughts, words, and actions. It is a dangerous, and slippery, slope. How much better to do like Psalm 1:2, meditating and delighting in the Word and in the Lord! The results are so much better! We will grow strong, like a tree, we will bring forth righteous fruit, and we will not wither. In other words, when under pressure, unlike Peter, we won’t wither and deny the Lord. We will be strong and stand firm! It seems to me that many Christians are facing diverse trials. One thing after another seems to go wrong. I know for my family, we have been hit hard. It started when a tree fell on our house. Eight weeks later, and we still don’t have a new roof because it won’t stop raining long enough for the roofers to do the job. That means the hole in the ceiling hasn’t been repaired. There’s no sense in doing that until the roof is fixed. Just a few nights ago, my hubby and I were watching TV when we heard a loud crash. I knew immediately what it was – the ceiling caved in. Thankfully, the damage wasn’t nearly as bad as what it sounded. During this time, we had one weekend where all three vehicles needed attention. After thinking all was taken care of, mine started acting up again. It’s nothing major, but it is annnoying! My daughter and I were both battling colds, then I ended up with a UTI. One evening, when I was using the broiler, I almost set the house on fire! I have had some major things happen at work, which required immediate attention, and the list goes on. I know I am not alone in dealing with these types of things. So many of my friends are going through some really tough trials. Honestly, it seems to me that the enemy thought he could bring me down with the tree issue. When a big issue didn’t sidetrack me and wreck my faith, it was like he switched gears, turning to constant, irritating things, day after day – just trying to wear us down. Yet, I noticed something. In the midst of all of this, I have maintained my sense of peace, and my faith has remained steady. As I was reading through some scriptures, I began to understand why I remained firm and wasn’t swayed by what we were seeing happening in our lives. Proverbs 14:27 tells us “The fear of the Lord is a well of life. Its waters keep a man from death.” (NLV) I had been diligent to “wash” myself in the Word. (Ephesians 5:26) The Word cleanses us. It can wash over all of those trials and irritating things of life and give us a peace that passes all understanding. It gives us perspective because we are reminded of the eternal, which makes the passing struggles of this life easier to face. Proverbs 14:30 says, “A heart that has peace is life to the body, but wrong desires are like the wasting away of the bones.” (NLV) As I have been diligent to study the Word, I have noticed that I don’t get “rattled” as easily. It’s easier for me to see the good in a bad situation because I have focused on Psalm 119:68 where it says God is good and all He does is good. (Emphasis added) Because I have been meditating on that scripture, I look for the good in the situation. For instance, when the cars all needed attention, my husband was able to do two of them himself. The result was that it cost less than $300 for all of them to be fixed! Also, I was off work that weekend, and just wanted to stay at home, so my daughter was able to use my car while hers was being fixed. No one was inconvenienced or stressed about having to find a ride! So what the devil was trying to use to discourage us turned out to be even more reason to give the Lord praise! “For the righteous will never be moved; he will be remembered forever. His heart is steady; he will not be afraid, until he looks in triumph on his adversaries.” Psalm 112:6-8 (ESV) This scripture has come alive for me in recent weeks. We have had a lot of bad news recently, but my heart is not afraid. My heart has been steady, peaceful, thankful, and trusting the Lord in the midst of all of this. Are you struggling? Have your trials worn you down, emotionally, mentally, physically, and spiritually? I want to encourage you to start digging into the Word of God. His Word is life! It is Living Bread for us! It will nourish us, encourage us, direct us, and bless us. “Blessed are those who obey his written instructions. They wholeheartedly search for him.” Psalm 119:2 (GW) When you wholeheartedly search for the Lord, He cannot help but bless you because His promises are faithful and true! Proverbs 22:3 tells us that a wise person sees sin and will hide. What a concept! How do we do that? As I spend more time in the Word, I find I am drawn away from certain activities. I no longer feel comfortable watching hours of Netflix or marathons of some of my favorite shows on TV. I can literally feel the spiritual life draining from me when I try to do that. Now I will allow myself to watch a show here and there, but not for hours. I choose to hide myself from those activities. I used to love to read fiction – especially mysteries! However, the Lord convicted me on how I could spend hours reading those books, but only spend a few minutes with Him. When I did spend time in His Word, it was more to cross it off my to-do list so I could relieve my guilt. As I have hidden myself from those books, His Word has come alive to me where I can’t wait to read it each day! I used to really enjoy spending time on the phone, talking with friends. However, I would often find the conversation turning to gossip, because the Word warns us that when our words are many, sin is not absent. Now that I work as a switchboard operator, when I get home, I literally ‘hide’ from the phone! I do not want to be on the phone at all when I am home, so in a sense, I’m hiding from the sin of gossip. The second part of Proverbs 22:3 tells us that the foolish go on, and they are punished. 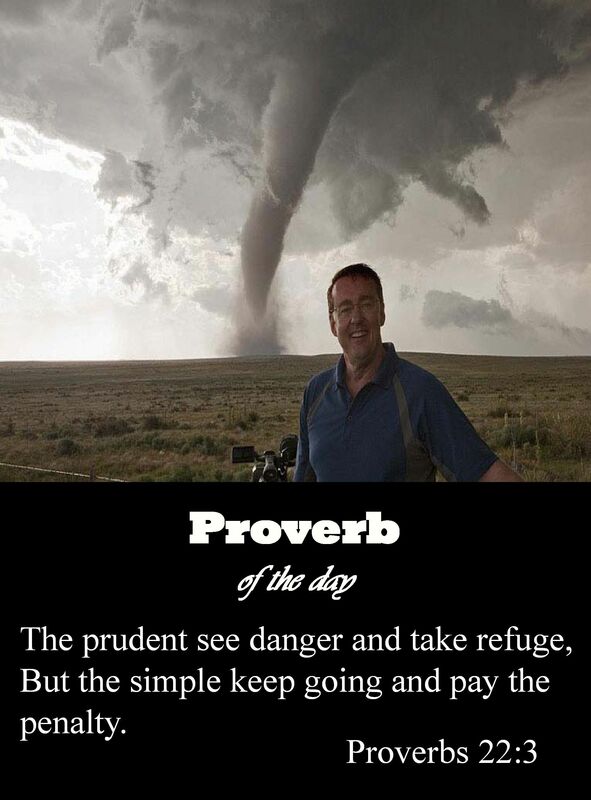 So by making wiser choices to hide from sin, we can avoid being punished. How might we be punished? It could be through a load of guilt for doing what we know is wrong. It could be from destroying a relationship because we didn’t choose to ‘hide’ from anger and unleashed some destructive words on someone. It could even be a physical ailment, due to the sin of gluttony or from harboring bitterness in our heart. However, I believe the worst punishment for foolishly going along with sin is the separation that comes between the Lord and me when I choose to hide sin in my heart. I firmly believe we are living in the last days. It is time to get serious in our walk with the Lord and not play games! It time to start hiding from sin! I have noticed something as I look into the eyes of people I pass while I’m walking through the hospital, getting groceries, shopping at the mall, and even attending church. Peace is missing. Instead, I often see fear and hopelessness. A few years ago, I got caught up in reading a lot of websites that were focused on supposed events taking place. I wanted to be informed so that I could prepare for what was coming. However, I became so fearful when I would read those websites The fear and sense of panic was so intense that I considered getting on medicine to help me cope. As I began to research much of what they were claiming as truth, I discovered that most of what they were touting as truth was extreme exaggeration. Their goal was to instill fear so deeply within me that I would spend a small fortune on their supplies, books, etc., to help in preparation for what was supposed to be coming. 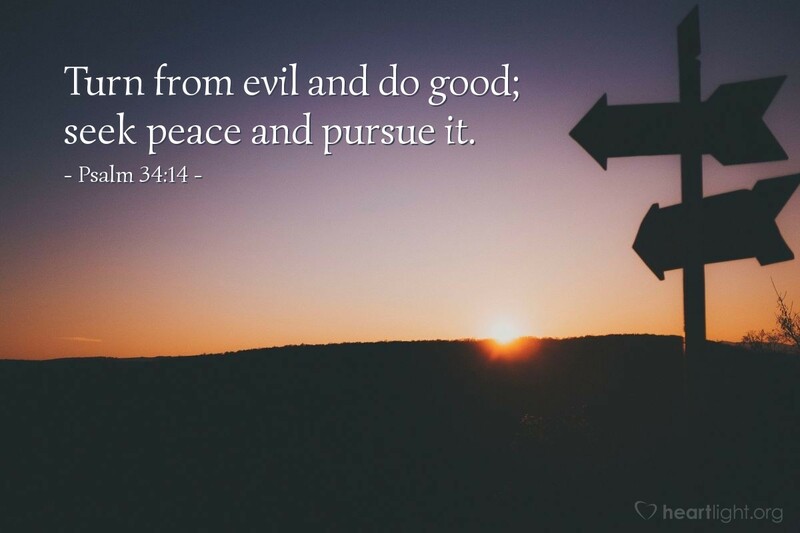 Psalm 34:14 tells us to turn away from evil and to do good, to search for peace and work to maintain it. I turned from evil by not allowing my eyes to view websites that thrive on instilling fear in me in order to deepen their pockets. I did good by choosing to read my Bible, which is ALL truth, and nothing but truth. I searched for peace by getting to know my heavenly Father more through His revealed Word. As I have come to know Him more deeply, my peace increases, in spite of what I see transpiring in this world. I work to maintain that peace by daily reading the Word – not just as something I need to cross off my daily to-do list, but I look forward to seeing what He wants to show me. My prayer is that you will also seek daily treasures in His Word, finding His peace to be your own in these last days. It is an amazing journey! I’m Hurt, So What Do I Do? What an excellent, biblical message on forgiveness! He says a couple of really powerful things. It’s always more rewarding to resolve a conflict than to dissolve a relationship. If you are battling fear of any kind, you need to hear this message! Even if you aren’t battling fear, this is a good message for the next time you battle it!